Kids play with their anganwadi worker at the anganwadi center in Ali Village. On a Friday morning, Ali village is a rare quiet spot amidst the chaos of New Delhi. Walking along the narrow streets of this sprawling, poor area in the south of India’s capital, it’s almost impossible to hear any of the usual sounds of the city, from honking cars to dhaba vendors. The only sound left is coming from a small stone structure at the end of a winding road. It’s the sound of children singing and playing. The building at the end of the road is an anganwadi center (AWC). It is one of more than 1.3 million such centers, spread out across India, that deliver early education, health, and nutrition services as part of the country’s Integrated Child Development Services (ICDS) scheme. ICDS was launched in 1975 to improve Indian children’s health and quality of life. A child born that year could only expect to live to be 51 years old—if they survived past birth, given that the infant mortality rate was 13%. Anemia, malnutrition, stunting, and under-immunization were common, especially among children of poor or marginalized backgrounds. The goal of ICDS was to help feed, educate, and care for vulnerable kids and their mothers. What was then a small-scale initiative became one of the world’s largest integrated early childhood programs. Groundbreaking studies conducted over the past few decades have shown us that a child’s early years have a disproportionate impact on the rest of their lives. According to Harvard University’s Center on the Developing Child, “experiences early in life can have a lasting impact on later learning, behavior, and health,” and those same experiences “actually get under the skin and into the body, with lifelong effects on adult physical and mental health.” That’s why an increasing number of countries are designing programs to invest in little kids; they know it is a cost-effective way to tackle inequality and raise a generation of healthier adults. Every country looking to make that investment can learn something from ICDS. The program is unusually ambitious in its drive to deliver high-quality health, nutrition, community education, and preschool education services to millions of vulnerable people. And, on paper, experts say it’s the ideal way to do just that. But the scheme has been plagued by institutional weaknesses for decades. As ICDS has expanded, it has shown how difficult it is to scale up programs that help vulnerable kids. In 1974, the Indian government’s department of social welfare launched the National Policy for Children (pdf), which outlined the country’s commitment to “provide adequate services to children, both before and after birth and through the period of growth, to ensure their full physical, mental and social development.” Children, the policy made clear, “are a supremely important asset” and would be placed at the center of India’s grand plans for the future. The anganwadi helper brings kids home for lunch. A year later, with the help of the United Nations International Children’s Emergency Fund (UNICEF), India launched ICDS with the goal of improving the nutrition, health, and development of children from birth to age six, monitoring and educating pregnant and lactating mothers, and helping vulnerable adolescent girls and women between 15 and 44. In every anganwadi center, an anganwadi worker (AWW) takes care of women and children, educates the community, and collects health and nutrition data on women and children. The AWW is supported by three people: an anganwadi helper; an auxiliary nurse midwife who provides health services to pregnant and breastfeeding mothers and delivers babies; and an Accredited Social Health Activist, or ASHA, who is a community health advocate and provides services like first aid, special needs referrals, and reproductive health counseling. Thanks to this massive network of centers, ICDS has an impressive reach. In 2017, it delivered preschool services to close to 33 million kids (pdf). 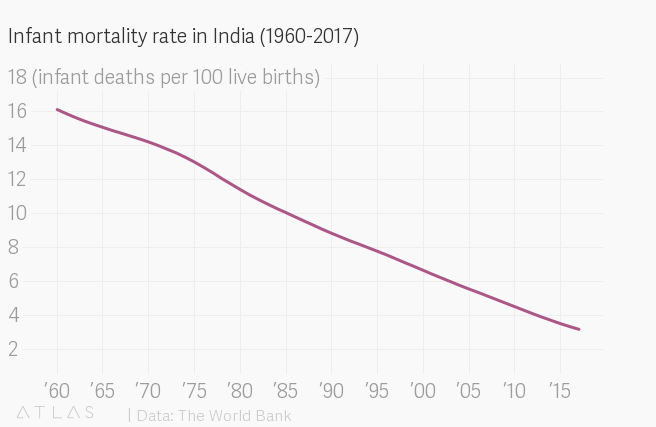 (There are about 127 million kids under 5 in India.) It also gave regular food rations to close to 95 million (pdf) young children and lactating and pregnant women. Hygiene classes in the anganwadi center in Ali Village. The preschool curriculum in anganwadi centers is outlined in the ministry’s National Curriculum Framework for ECCE (pdf), which aims to “promote early stimulation and play-based, experiential and child-friendly provision for early childhood education and all round development.” In other words, anganwadi centers should be places where kids have fun and learn skills that will lay the groundwork for their entry into formal schooling. For example, the national curriculum asks AWWs to stimulate three-to-four-year-olds’ physical and gross motor skills by encouraging them to string beads or hop around the room. It recommends asking four-to-five-year-olds to identify colors and shapes and match them to other objects of the same shape or color, which helps increase their cognitive skills. And it advises AWWs to ask five-to-six-year-olds to narrate stories and take an active role in classroom activities like festivals or field trips, in order to develop language and social-emotional skills. ICDS programming is unique because it accounts for the fact that caregivers largely shape kids’ early experiences. Accordingly, anganwadi workers give nutrition and health education to the mothers of children who attend their centers. In Ali village, some mothers even stay at the center and play games. The anganwadi center is a place where parents feel safe leaving their kids to go to work, and it keeps unattended children off the streets. The ICDS scheme also provides pre- and postnatal care for women. Prenatal care has been shown to save lives (pdf), but only 51% of women in India received it in 2014. Under ICDS, women are encouraged to breastfeed their newborns exclusively for the first six months of life, which is recommended by most medical organizations. Currently, only 54.9% of Indian infants between zero and five months of age are exclusively breastfed. But other papers (pdf) have cast doubt on these findings, suggesting that ICDS does not have a large effect on malnutrition. The discrepancies in the research point to a lack of large-scale, quality impact studies on ICDS, which is concerning, given that the scheme cost the government $2.31 billion (pdf) in the 2018-2019 fiscal year. Kids play with the anganwadi worker in Ali Village. At the anganwadi center in Ali village, 15 small children little kids draw and count shapes on blackboards and play with cardboard cutouts of toothbrushes to learn about personal hygiene. They get up, dance, and sing the Hindi version of “heads, shoulders, knees and toes.” This is the kind of early childhood learning that ICDS promotes: Creative exercises foster children’s literacy and numeracy skills, and the games help them develop necessary real-life skills, with the end goal that both their minds and their bodies be active and healthy. But this anganwadi center is also drafty and has no heating, even in the winter. The only source of light in the small house is a lamp-torch that a neighbor donated. The ground is dusty underneath the thin blankets the anganwadi helper had laid out, and the kids, most of whom are barefoot, aren’t told to wash their hands before playing or eating. The anganwadi worker seems overwhelmed; she leaves the kids in front of a video on her cell phone while she fills out paperwork. The center is a clear example of how stretching the ICDS system so thin has reduced the quality of the services it provides. The biggest problem plaguing ICDS is that “the program has expanded faster than the institutional capacity to manage it,” according (pdf) to The World Bank. That’s something that happens a lot with ambitious early childhood programs. The anganwadi center in Ali Village. In 1992, the National Institute of Public Cooperation and Child Development (pdf) found that 27% of AWCs didn’t have enough food supplies to feed all their students for periods of more than 90 days. 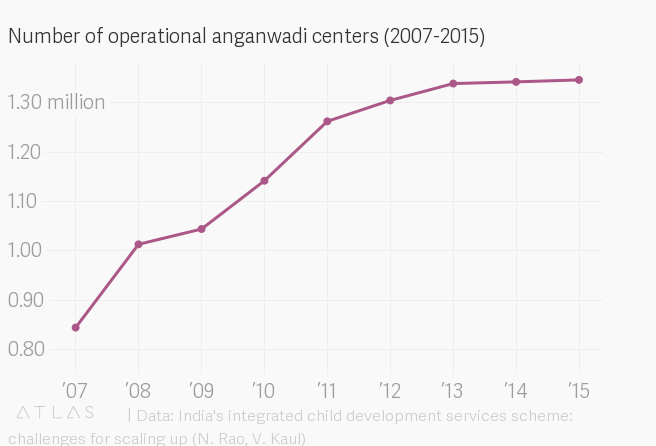 Several other studies found that anganwadi centers regularly lack enough food and the right supplies, like plates or ladles. As the number of AWCs has grown, the Ministry for Women and Child Development has struggled to hire and retain enough anganwadi and ASHA workers. That’s because the workers are underpaid, overworked, and undertrained. They are not formally recognized as civil servants, meaning they don’t have access to the same benefits, and many complain they can’t afford to feed their own children. Absenteeism and vacancy rates are incredibly high in certain states. In recent years, both anganwadi and ASHA workers have staged large-scale protests across India and discontent is brewing. India is not the only country where those who work with young children are paid, mentored, and trained less than other educators. A survey conducted in 2016 showed that one in five early childhood workers in Australia was planning to quit their job in the next 12 months because of low wages, abundant paperwork, and a feeling of being undervalued. And a 2018 study conducted by researchers at the University of California, Berkley found (pdf) that the “system of preparing, supporting, and rewarding early educators in the United States remains largely ineffective, inefficient, and inequitable.” The problems with ICDS services show us how under-investing in childcare workers ultimately comes at a cost to a country’s kids. The Indian government has started experimenting with some possible solutions for ICDS, including piloting apps and other digital platforms to ease the burden of data collection for childcare workers. And prime minister Narendra Modi recently announced a country-wide pay raise for anganwadi and ASHA workers, as well as increased social security benefits. But critics say the government needs to do more to help and grow the country’s massive early childhood workforce. As the gaps in ICDS services have widened, private organizations and nonprofits have stepped in. One group, called Mobile Creches, works with developers to provide creche services to the children of migrant workers who live on construction sites, out of the reach of ICDS and most anganwadi centers. And Sesame Street has supplied learning materials to thousands of anganwadi centers since 2007 and trained AWWs in how to teach kids through play. But these efforts are not enough. For ICDS to work, the government needs to invest in training and retaining quality early childhood care workers, fix the crumbling infrastructure of many anganwadi centers, and deal with the accusations of wasted resources and widespread corruption that have plagued the scheme since its inception. Until it does, children will continue to fall through the cracks.